Join us each Sunday at 9:00am (quality coffee; light refreshments at 8:45am) for both adult and children’s Catechesis. Catechesis is an old word that simply means “teaching”. It’s what all of us who are desiring to grow in faithfulness toward Christ need! In some ways, you may find that what we do during Catechesis is similar to what churches call “Sunday School”. For us it fits as part of our overall ecosystem intended to help our congregation live all of life in reference to Christ. Perhaps the simplest explanation for a Catechumenate is to think of it as a Christian cultural immersion process—a training track for people learning to be disciples of Jesus. Catechumenate is a Greek word derived from the words for “echo” and “down.” It’s the idea of something traveling down through time. What is traveling down through time? The Christian Faith. The concept of the Catechumenate is a very old one, going back nearly 2,000 years. The original Catechumenate was built with the assumption that all Christians must be formed—we must be enculturated into the Body of Christ. This means that we must receive the Christian Faith from those who went before us and be transformed via some kind of intentional process. The catechumenate is a life-training, Christian identity-formation community. It exists to enculturate us into Christ’s Kingdom. While the whole life of the church, with its rhythms, gatherings, teaching, relationships, practices, and experiences is formational, we recognize that it is essential to offer a more intentional and in-depth opportunity for people to be formed into Communion with Christ. For details about our Catechumenate Cohort, visit the Catechumenate page. The spiritual formation of Eucharist can be summarized visually in the following diagram. At the center of the Core Elements you will find the beating heart of the church, which is Holy Communion / collective worship. This is both the end toward which we strive and our greatest means of sustenance toward that end. Our conviction is that Worship/Communion, when combined with the other three aspects of the Core Elements work together to shape us into people who live all of life in reference to Christ. 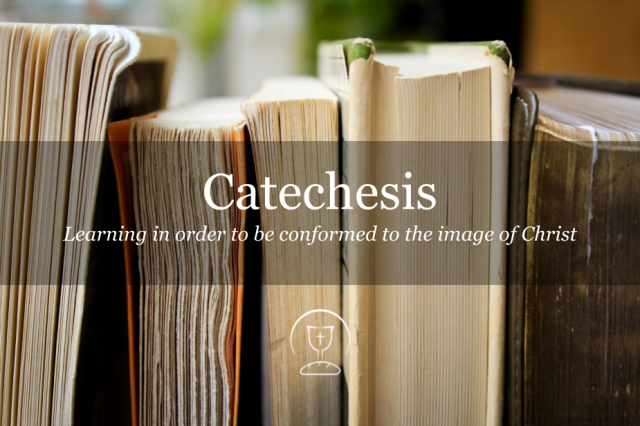 FORMATION | CATECHESIS – This space for teaching and discussion plays a catalytic role in shaping the content and direction of the spiritual formation agenda of our church. When we talk about catechesis we’re mostly focused on weekly catechesis (Sundays at 9am) but we also include special seminars, classes and retreats in this as well. We offer both adult and children’s programs because we believe that everyone needs to be formed into Christ. TABLE GROUP – This is the basic setting of belonging. It is a highly relational setting in which people practice Christian love and feel a sense of delight in being together. It’s the place where Christians can offer Christian hospitality to those seeking. The basic format will always be some variation of: meal, sharing/discussion, Evening Prayer. PERSONAL | FAMILY PRAYER AND WORSHIP – Perhaps the most basic building block of Christian formation as far as Eucharist Church is concerned is daily prayer and worship, ideally engaged three times daily (morning, midday, evening/compline). The lectionary that is read as part of this practice keeps people steadily reading through the Bible in a life immersed in the Word of God. The goal is to get every person who considers Eucharist Church their home church living according to an adapted Rule of Life that provides helpful structure to the rhythms of family and personal life, hopefully leading to a deep kind of freedom and fullness in Christ: the good life! 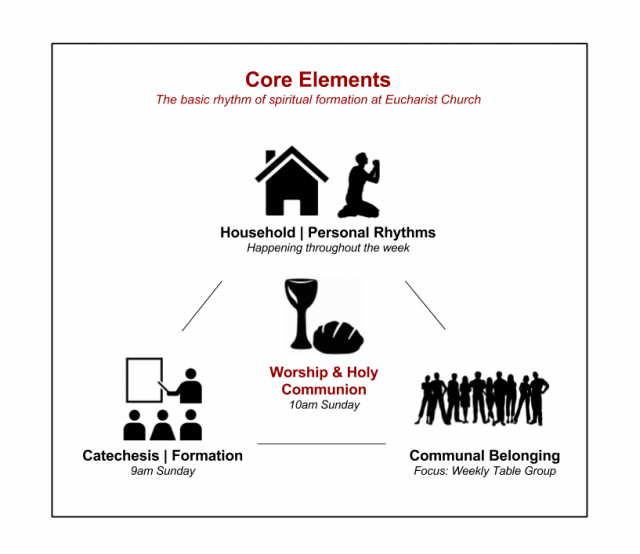 These are the four “core elements” of Eucharist Church. To be involved in them is to be formed into Christian Communion (even if unknowingly so).